This page is where we will highlight our PAWSOME teachers, staff, students, volunteers, and projects! DES is so GRATEFUL for these two lovely ladies! 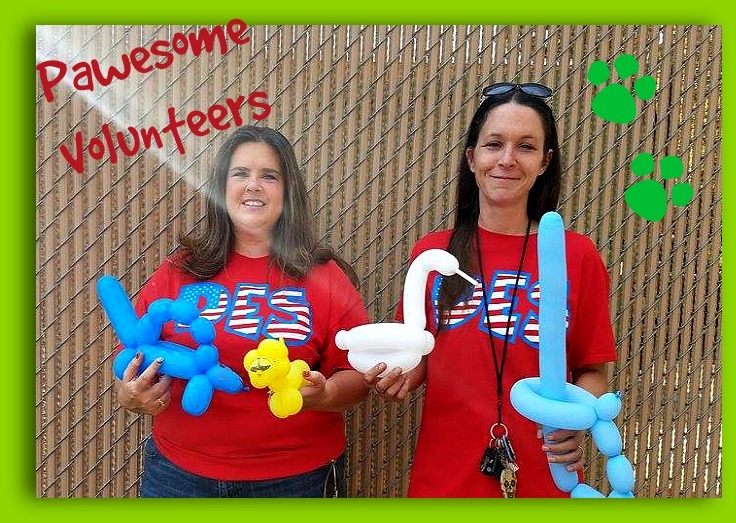 Debi Dale and Christina Erickson were a big help on Fun Day! They made some amazing balloon animals and creations for the students! Thank you both for taking time out of your busy lives to put smiles on the kids' faces! (And in case you are wondering, YES, they do parties!) DES and the PPA thank you for ALL you do! Mrs Byrd definitely earned being our PAWSOME Teacher this week! She volunteered to be in the dunk tank at the PE's Fun Day Fundraiser! Thank you Mrs Byrd for making the students' day! Asia Pearl from Mrs Arrighi's 1st grade class won a Toys R Us gift card in our Back to School Box Tops Drawing! Keep saving Box Tops! Our next collection contest will be in October! MRS MASON'S CLASS WAS THE VERY FIRST TO GET 100% IN PPA MEMBERSHIP!!!! WAY TO GO!!! YOU ALL ROCK!! And a BIG CONGRATULATIONS to Mrs Mason! She gave birth to a brand new baby boy on August 31st! Meet PAWSOME STUDENT, Alonna Bryant! She designed this year's Spirit Shirt! Good job Alonna!